If you have recently made the decision to replace a cracked or damaged driveway, the first thing you must decide is the type of material you want to use. Asphalt and gravel are possibilities, but concrete driveways have several advantages over both of these types. While other types must be patched and replaced often, driveways made of concrete have an average lifespan of 30 years. You also don’t have to worry about potholes and bubbles forming in your driveway and causing widespread damage. When you have a new concrete driveway installed, it’s helpful to think of it as a one-time investment. Because concrete is so durable, you shouldn’t have to replace your driveway more than one time over the years that you own your home. This material stands up to severe weather and the daily wear and tear far better than the other asphalt and gravel. 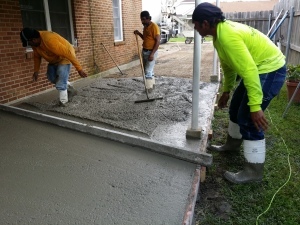 New concrete driveways come with built-in skid resistance, making this an ideal choice for families with young children or who have frequent visitors from elderly family members. Concrete decreases the likelihood of a fall and gives off a reflective light that illuminates your home. Your family and visitors are less likely to hurt themselves as a result. One of the first things you are likely to notice when we install your concrete driveway is its neat and uniform appearance. You are welcome to choose colors, textures, and patterns that represent your own preferences. It may spark your imagination to look at photos of completed projects by Bayou Concrete. Our company offers free estimates to all new customers. You may contact us to request one during regular business hours as well as Saturdays until 12:30 p.m. You can also request a call back by completing a form on our website. While you’re there, check out our numerous photographs of completed projects.